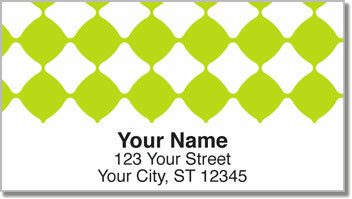 Stick something sweet on your outgoing mail with this citrusy set of return address labels from CheckAdvantage. Beads of vibrant green look like a string of juicy limes ready to be sliced up and slipped into your drink for a refreshing finishing touch. These stylish labels are also a fantastic way to finish off your letters and packages with some colorful personality. But appearances aren't everything! This product is actually quite convenient. A self-adhesive backing makes it easy for you to prepare outgoing mail in a snap. Just peel and place. Get your own Lime Green Bead Side Tear Checks today! Look for three other color options as well as a set with all for vibrant shades.